We could probably argue about whether We Have A Pope is a satire or a parody all day but we don't need to because I've decided. Its neither. We Have A Pope is actually a 'what if...' drama. 'What if the pope had a crisis of confidence? ', director Nanni Moretti seems to ask. Played straight down the line this could work as an honest look at the Catholic church. Only its not played straight down the line. It's definitely played for laughs, which brings us back to the original consideration of satire and parody. If it's either then I'm going for satire - Moretti looks at the inner-workings of The Vatican and then accentuates and distorts them for humorous effect, supposedly to help educate us and them. For it to be a parody he would have to be altering something that already exists and I'm not sure anyone has ever made something from inside The Vatican. Anyway, it doesn't matter because to be either of these things We Have A Pope would have to be both substantially funnier than it is and have something behind its humour. One scene in We Have A Pope - the psychoanalyst (Moretti himself) discussing the priests' various sleeping pills and tranquilizers - is laugh out loud funny. The rest of the jokes aren't amusing enough to make your mouth curl. 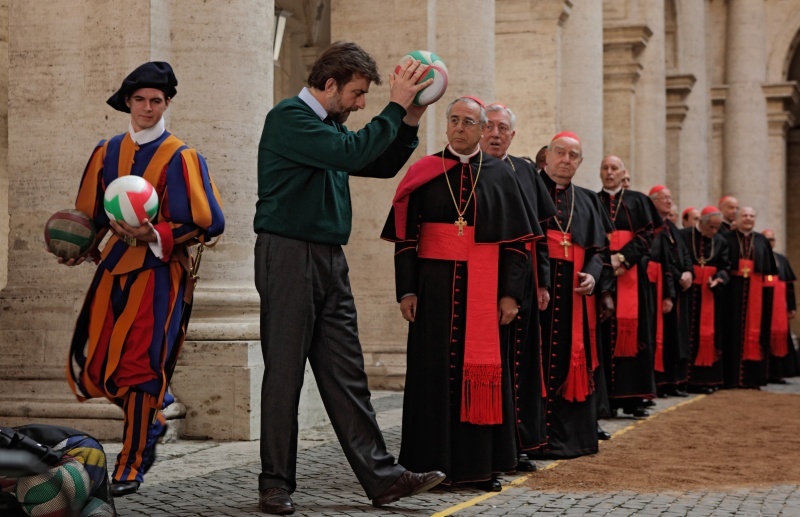 Several moments of the film verge on saying something about the Catholic Church but then wander off to play with a ball that looks much more interesting. Actually, wandering off to play with a ball literally happens to the plot at one point. There's nothing here we haven't considered before (hardly a problem in its own right) and that which is here is presented flatly and with several inadequately developed divergences getting in the way (definitely a problem in its own right). Examples of the latter are numerous; what point does the volleyball tournament serve? Why is the female psychoanalyst (Margherita Buy) introduced? Where does her story go? Why does it go all serious at the finale and then just end without conclusion or comment? There's possibly something lost in translation, certainly the comic timing is, but there's little evidence that there was much here worth translating in the first place. Very flat and occasionally even dull.